Thanks to a request from staff in HCA the Library now has access to The SHAFR Guide Online: An Annotated Bibliography of U.S. Foreign Relations since 1600. This is a near-comprehensive, 2.1 million-word online annotated bibliography of historical work covering the entire span of U.S. foreign relations. You can access The SHAFR Guide Online via the Databases A-Z list, History database list and other relevant subject database lists. You’ll soon also be able to access it via DiscoverEd. 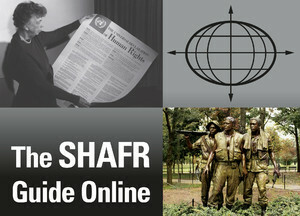 The SHAFR Guide Online covers all eras in U.S. history from colonial days onwards. It also includes four new thematic chapters—on economic issues; non-governmental actors; domestic issues, the Congress, and public opinion; and race, gender, and culture. Created by the Society for Historians of American Foreign Relations (SHAFR), entries in the guide are drawn from many sources, from collections of government documents to biographies, monographs, book chapters, journal articles, web sites, and more. Access The SHAFR Guide Online via the Databases A-Z list, History database list and other relevant subject database lists. Access is only available to current students and staff at the University of Edinburgh. This entry was posted in Books, Library, New, Online resource and tagged 17th century, 18th century, 19th century, 20th century, 21st century, Databases, E-books, History, International Relations, Politics, United States by cstirling. Bookmark the permalink.